On a Saturday morning with no cars on a two vehicle lanes one directional street, this parking officer blocked the bike lane instead. He can’t even park next to the curb to give citations. Pathetic! 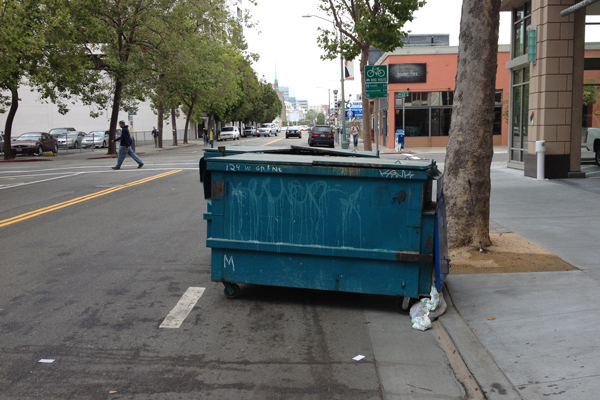 Bike lane is blocked by two trash bins. That is how bicyclists are treated. UPS truck parked on the northbound side of Franklin St. in downtown Oakland – May 2014. Last time, I wrote a post about bike lanes being blocked by all sorts of things from delivery trucks to piles of dirt. I had never seen a vehicle parked outside a bike lane, but there was this UPS delivery truck that to my surprise did something out of the ordinary-park on the outside of the bike lane. I wanted to thank the driver but he/she wasn’t there. 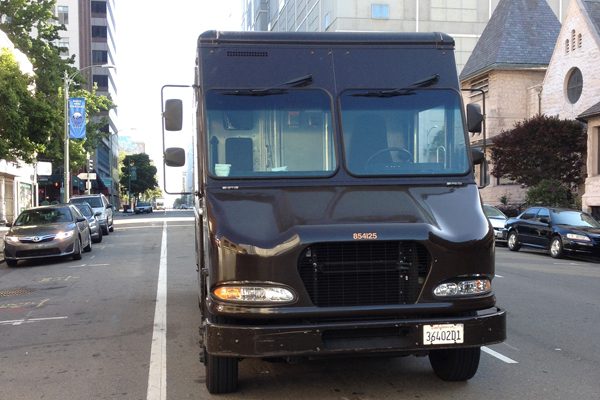 But this time, I saw another UPS truck parked outside the bike lane and was able to catch the driver. 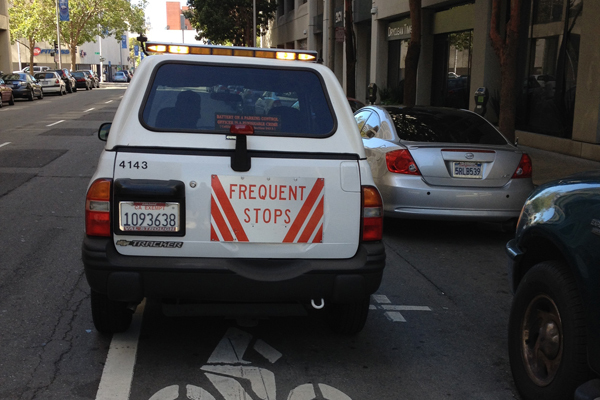 I asked the driver, “Is it the company’s policy to not block bike lanes? It’s the second time I’ve seen this.” She shook her head, no. Then I asked, “Did you purposely park there to leave the bike lane open?” To my surprise, she said that she just didn’t want to block any cars that wanted to park or leave. Anyhow, I still wanted to let her know that it’s a good thing she didn’t block the bike lane because it can be dangerous for cyclists to have to weave out into traffic when bike lanes are blocked. She said, “No wonder! There was this female cyclist earlier waving to me to say thank you but I didn’t understand.” I hope that the UPS driver, knowing what she knows now, will do the same thing everywhere when she’s behind the wheel. Yep, we bicyclists still get no respect! 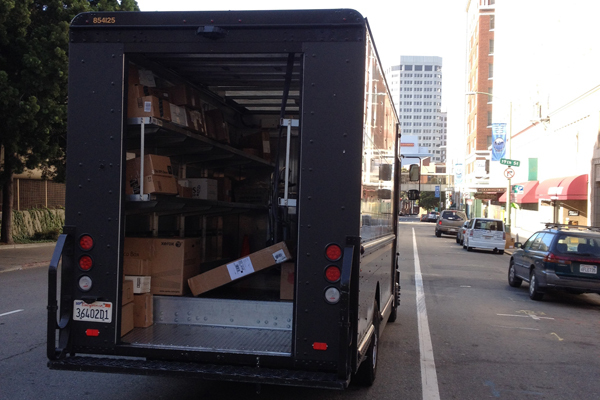 UPS truck parked on the southbound side of Franklin St. in downtown Oakland – June 2014. Be safe and cycle well! Similar to the UPS parking spot, another delivery van parked outside of the bike lane. 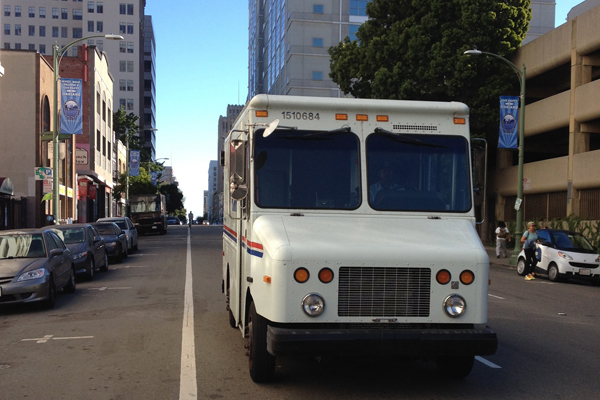 I gave this USPS driver a big ‘thumbs up’ and he nodded. I hope he knows not to block bike lanes.